My great grandfather built this quirky, little two bedroom house in Carlsbad, New Mexico in the early 1940â€™s. Its ceilings are only seven feet high, giving it a cramped feeling, and the flooring was fashioned from WWII bomb boxes. Even my dad, who retired early to become a full time writer in the mid 90’s, lived in the house for eight years. 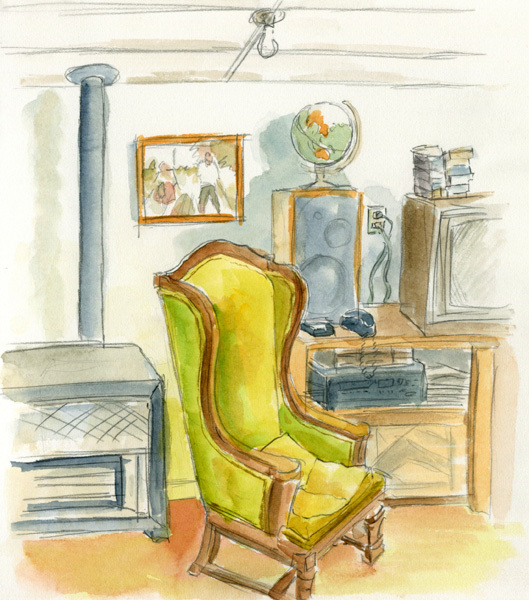 While visiting my dad in Carlsbad ten years ago, I sketched several of the rooms of the old house including the kitchen and living room. 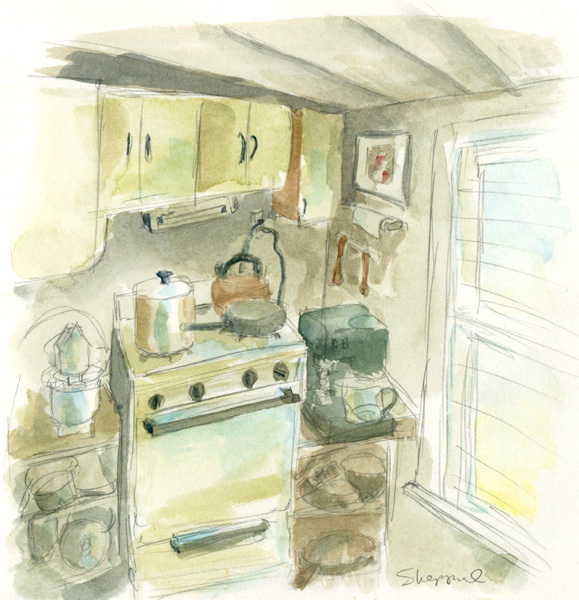 The kitchen perspective is off but thatâ€™s ok; it gives the drawing character and shows the house’s off-beat personality. There are two attractions worth visiting while here and neither are located in the town of Carlsbad. The first is an out of this world experience: visiting the UFO museum in the nearby town of Roswell. On the drive into town, a string of billboards clearly informs visitors about aliens who crash-landed there in 1947. Supposedly, their bodies’ and space ship were removed by government authorities and eventually ended up at Wright Field in Dayton Ohio. The second experience is more earthy, or more literally, in the earth, Carlsbad Caverns. These hauntingly beautiful caves were carved deep beneath the limestone foothills of the Guadalupe Mountains, when sulfuric acid within the hills leached down to dissolve the limestone. Not only are the caverns awe-inspiring in size, but their limestone formations resemble a landscape that might as well be from another world. Nearly 400,000 free-tail bats also live in the caves, and in the summer months, swarm around the cavern eating several tons of bugs each night. After visiting with my dad for a few days, I flew back to Healdsburg less than a week before September 11, 2001. It was good to be safe at home with Marilyn and our two Australian Shepherds. September 5, 2011 March 29, 2013 Richard SheppardComments are off for this post.